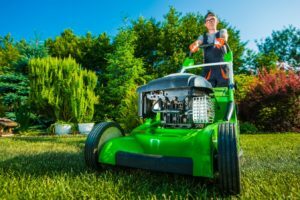 Springtime Lawn Aeration | Schulhoff Tree & Lawn Care, Inc.
For many homeowners, the spring season comes with an expansive checklist of cleaning, decluttering, and home maintenance tasks. One of the most important priorities on any homeowner’s spring cleaning checklist is his or her outdoor spaces. The work you do in the spring lays the foundation for the lush, healthy growth of summer. In many cases, the spring checklist in any yard with grass should begin with professional lawn aeration. In this blog, we discuss the basics of why lawn aeration is so beneficial, particularly in the springtime. Lawn aeration is a process that creates openings of a uniform size spaced evenly across the ground in your entire lawn. This task may be accomplished using any one of three aeration techniques, depending on the type of machine employed. The types of aeration available include core, slice, and spike methods. If you have an image that comes to mind when you hear the term lawn aeration, you most likely picture a lawn that has been aerated with a coring aerator. This variety digs into the ground and removes small cylindrical sections known as plugs. These soil plugs stay on top of the lawn after the aeration. Slicing aerators use sharp blades to make parallel cuts into the ground at a predetermined depth. The openings left by a slicing aerator tend to be significantly smaller than those left by coring or spiking machines. Like coring aerators, spiking aerators create a series of holes in the ground in a set pattern. However, instead of pulling plugs of soil out, spiking aerators use tines to push through the ground and create the deep holes. Your lawn care specialist may use a particular machine type according to the type of climate you live in or the amount of soil compaction in your yard. How Does Aeration Benefit Your Lawn? In most cases, your lawn will receive optimal benefits from annual aeration. However, the timing of your ideal aeration may vary. Which Lawn Types Need Springtime Aeration? You may need a second aeration in the fall, especially if you plan to overseed during that season. If you are not sure whether you need to aerate your lawn this spring or at another time to get the maximum benefits, consult with a lawn care specialist. How Can You Prepare Your Lawn for Professional Aeration? Make arrangements for any children and pets to ensure that your lawn care specialist has time to thoroughly make multiple passes over your entire lawn without interruption. Mark all potential obstructions, such as sprinkler heads and utility lines. Mow the lawn to ensure that the grass is at a uniform height. Test the moisture of your lawn — you may need to water if you have dry soil or work around seasonal rainfall to ensure your lawn care specialist isn’t working in mud. In addition to these fundamentals, ask your lawn care specialist if they have any recommendations or policies they would like you to work with in preparation for this service. For example, your lawn care specialist may give you an exact number of hours or days to water before your service according to the recent local weather. As you complete your spring cleaning checklist, don’t forget to schedule a professional lawn aeration. You may also want to consult with a lawn and tree care specialist to ensure that your grass and every other plant in your yard has the care it needs to thrive in the upcoming year. For comprehensive outdoor services, trust the expert certified arborists, horticulturists, and foresters who make up the team at Schulhoff Tree & Lawn Care, Inc.